Honey cottage is a lovely detatched property, has 3 bedrooms 2 double 1 with en-suite and 1 twin. A well equipped kitchen with washing machine and dishwasher, etc., dining room with Log burner, lounge with doors leading to conservatory. The cottage has a pretty garden with outside seating. There is also a downstairs cloakroom as well a first floor bathroom and shower. The cottage has its own parking space opposite the cottage as well as an integral double garage which links to the conservatory. Honey Cottage is just 300m from the sea front where you can try rock pooling or just relax by the sea. All prices stated are for the cottage only sleeping 6 people. There is a studio available with own bathroom and bed available on request. Local attractions: For the children there is Watermouth Castle,a fun day for all with dungeon scenes, theme park, etc which is 1 mile away. Combe Martin Wildlife Park with big cats and a dinosaur theme is 5 miles. The Golden beaches of Woolacombe and Croyde are a short drive . The pretty harbours of Ilfracombe is within 1 mile south and Watermouth Harbour is 1 mile north. Trips to the island of Lundy can be made from Ilfracombe, as well as sea fishing and diving. The coast path runs close to the cottage. Dining and shopping: There are 2 pub /restaurants within walking distance. The larger towns of Barstaple and Bideford are 30min drive away both have pannier markets. Lynton and Lynmouth with its unique cliff railway is well worth a visit and a drive back through the valley of rocks to woody bay and hunters inn is well worth it if you like stunning scenery on the edge of Exmoor National Park,all this within 10 miles. Wendy and i bought the property with a view to moving down to North Devon at a later date. But unfortunately that has not happened yet as commitments with a busy manufacturing business and children, with new grand children keep us in Buckinghamshire. for the time being. We moved to Buckingham from Chesham in 1996 but we always enjoyed holidays in North Devon with the Children. Now grown up with their own families they to love the area, and often use Honey Cottage of Course. Honey Cottage ticked all the boxes for us nicely tucked away but within a short stroll to local pubs and restaurants, golf and sea front. We have tried to keep the cottage in good condition. With old properties there is always work to be done. There is a double integral garage . The Balcony is a new addition which is off the studio. You can use the balcony even if you are not renting the studio. One small well behaved dog would be considered with an extra cost of £20. Honey cottage is well located for beach and coast walks with friendly local pub and restaurant close by. Cottage was warm and comfortable with modern bathrooms. Ideal for families as lots of room. 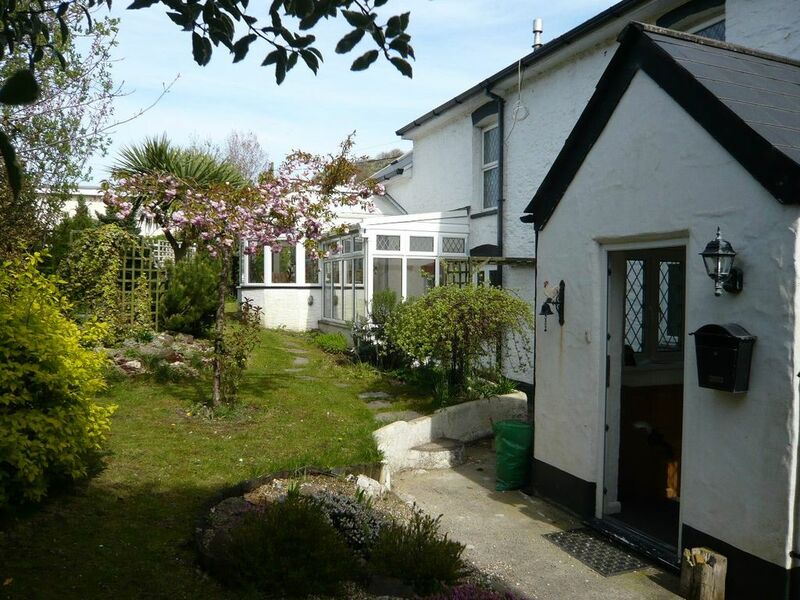 A spotlessly clean, very comfortable, spacious cottage, in a lovely quiet location. The garage, with remote control, was a real bonus. The Hele Bay Pub offers delicious, freshly prepared meals and has really friendly staff. Richard always responded quickly to emails - great to deal with. Lovely cottage close to lots of beautiful scenery and places to visit. We have just had a lovely holiday in this cottage and appreciated the thoughtful touch of the welcome bottle of wine and biscuits.The cottage is equipped with almost everything you could possibly need and is spotlessly clean and tidy. There are loads of lovely places around to visit and many activities to suit everyone. There are a couple of pubs with restaurants within walking distance. The only thing I would suggest is a non slip mat in the shower in the en suite .... I was afraid of slipping so we bought a mat ourselves. Thankyou to the owner who communicated well with us and answered any questions immediately. We thoroughly enjoyed every moment of our holiday and would recommend it to anyone. The May Family. Lots of room and good facilities. Would be very happy to return. Stayed here for a week in May 2018, 4 adults and 2 children and a small dog. Lovely spacious cottage in a good location. Just spent Christmas in Honey Cottage. Nanny, Grandad, Mum dad & 13 & 15 year old boys. What a lovely place & so well equipped. We even managed to cook a full Xmas dinner. Lots of space to have quiet time if required. A plus was the WiFi which worked perfectly. Richard did everything possibly to make our stay enjoyable. We were a bit worried being winter that it may have been cold/damp. This was definitely not the case, plenty of heating & hot water and spotlessly clean. Perfect location for so many places. A bit hilly so not suitable for those with walking difficulties, but that is Devon. Can recommend both the Hele Family Pub & Hele Billies great atmosphere in Billies & food is lovely. The pub has a games room downstairs with a skittle ally, dart board & soft play area for little ones. We will most definitely be going back. Honey Cottage is situated in a quiet area in the old Hele Village and only 250 m from Hele sea front, popular for rock pooling and walking.Close to watermouth castle and the stunning Exmoor coast. There is a local mini market and garage within 100 m where you can also catch a bus into town. Stream runs nearby which also feeds the Hele corn mill and tea rooms. The cottage itself was built circa 1750 and was originally 2 cottages. The property has been recently refurbished and extended. The cottage has gas central heating and a newly installed multi fuel burner. Golf: Ilfracombe Golf Course is only 1/2 mile from Honey Cottage, pretty 18 hole golf course with sea views from every hole. Other Courses nearby are Willingcott, and Woolacombe& Morthoe. There are also Championship golf courses at Saunton and Westwood Ho which are a short drive away.